All of the Pink fry from eggs reared at Nanaimo hatchery are now in the three pen sites. The 200,000 fry at the Newcastle Island ferry dock (city side) have already doubled their weight to 0.5 grams after only two weeks and are feeding voraciously. These fry will be the first batch released in another two weeks or less at a weight of about 1 gram. The Jack Point pen that was moved to Gallows Point for safety reasons is perfectly sited with just enough current to clean the pen but not so much that the fry (400,000 +) are burning up calories just to stay in place. The pens at Brandon Island (another 400,000 + fry) are also functioning well. Of interest at this site are the pink fry that are swimming around outside the pens. The pen nets were checked for holes and these fry are not ours. Last fall, a few dozen adult pinks were observed milling around the estuary of Departure Creek. 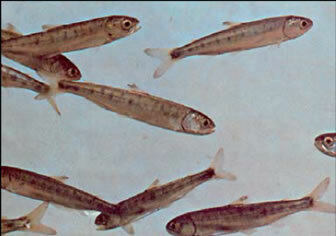 Pinks are known to spawn in brackish water so it is quite possible that the fry observed at Brandon Island are the progeny of pinks spawning naturally at the mouth or lower reach of Departure creek.